Two local equestrians are hoping to be on the U.S. team going to the World Equestrian Games later this summer. Dr. Meg Sleeper of Kingwood Township has two of the 16 horse-rider combinations on the Long List for 2014 Alltech FEI World Equestrian Games chosen by United States Equestrian Federation (USEF). Syrocco Cadence, an 11-year-old Arabian mare and Syrocco Reveille, a 14-year-old Arabian mare are both owned by Sleeper. 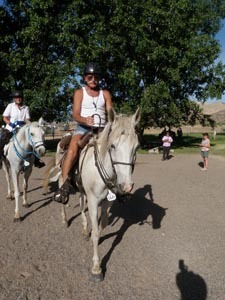 For the 22nd year, local horse and riding enthusiasts have completed the Jo Tate Memorial Endurance Ride at the Flag Springs Conservation Area, west of Washburn. A total of 29 riders participated on the first day and 18 on the second, doing the 25 and 50-mile treks. The 59th annual Tevis Cup is open for entries! No matter the size, you've got a good crowd when some of the '-est' guys and gals show up at your endurance rides. There's not much different about 59,000-mile Dave Rabe since his riding accident back in December of 2012 other than wearing a helmet (a good thing!) - he still wears shorts, he still rides the same couple thousand miles a season, he still rides the same white horse that might have killed him, and he's still the same nicest, Helping-est guy in camp and on the trails. Need help marking trails? Dave will show up early and help you. Got a problem with your truck or trailer wiring? Dave will help you sort it out. Need Easyboots glued on before the ride? Dave will do it for you. Keep throwing your Easyboot Gloves on trail? Dave will stop to help you get a better fit so you can continue on your ride. Need help unmarking trail? Dave will do that too. 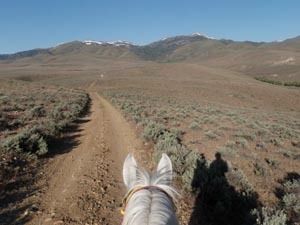 Much of all this in addition to bringing 3 horses to the 3-day Owyhee Fandango, riding 50 miles the first two days, and riding the 100 on Day 3. This including riding his rogue horse White Cloud on the 100, the horse responsible for his accident, the one he still has to always be alert while riding, since White Cloud will still pull stunts if Dave is not paying complete attention. Why ride such a horse? "Because he's a good horse!"